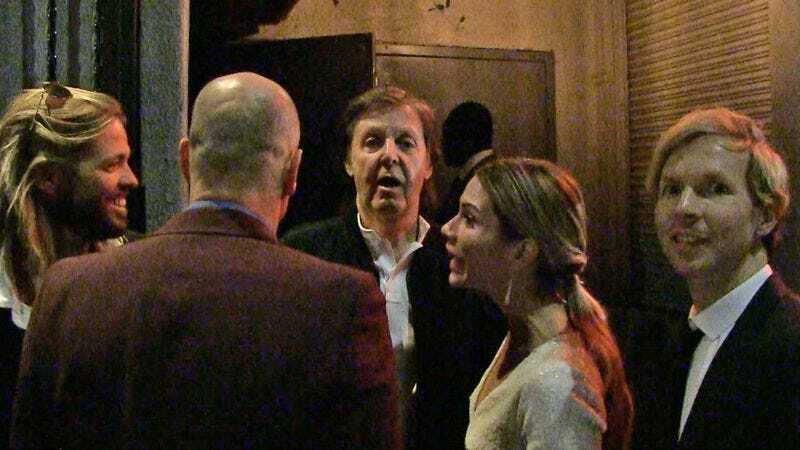 Kanye West protege Paul McCartney was denied access to living legend Tyga’s Grammys after-party at Argyle in Hollywood last night, according to some footage obtained by TMZ. “How VIP do we have to get?” asks the singer/guitar player, who appeared on 2015’s “FourFiveSeconds” alongside West and Rihanna. (McCartney also dabbled in songwriting on some lesser known British singles from the olden days.) “We need another hit!” the up-and-comer flippantly remarks to a gentleman who appears to be Rules Of Engagement and Ridiculous Six actor David Spade. The two entertainers, along with oldies drummer Taylor Hawkins, eventually made their way to Hyde for the Republic Records party, to which they were able to gain access. Tyga is perhaps best known for dating a teenage Kylie Jenner.